Do not intimated by the word "free" you are required to do something in return. LINE app users is happy that they could get a free sundae cone. Entitlement was only for LINE users. If you do not have LINE app in your smartphone now, download it first. 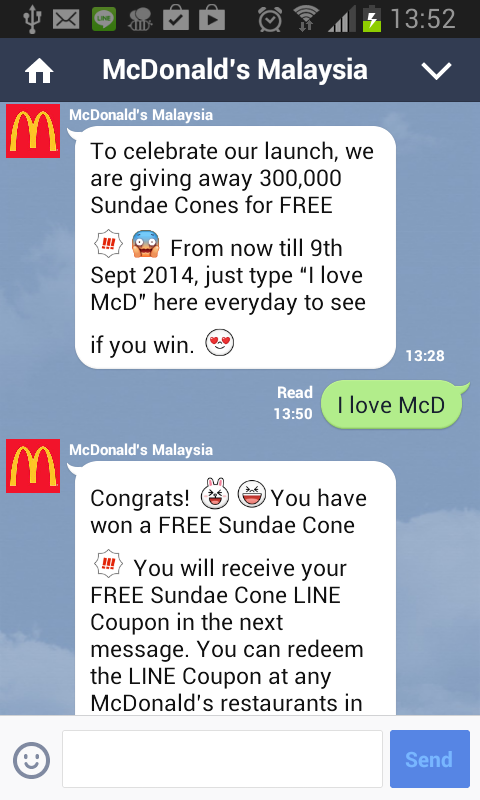 After downloaded the LINE app, go to More then Official Account, search for McDonald's Malaysia and subscribe it. When you get a message from McDonald's , type "I love McD" and you must meant it. If the quota is not fully used, you will get a congratulation message. Open the message you will get a code that you need presenting it to McDonald's staff at any branches. Do not forget to order a McDonald's burger because it will be totally embarass just drive in and get a free sundae cone.